Dr. Bowen often referred to the concept of differentiation of self as the “cornerstone” concept. It describes the variation in nature, especially human nature, and it shows us a way to do better with what we have inherited—both genetically and in the emotional process of the generations—from our families. It is a cornerstone for thinking about and accomplishing better functioning in any individual life. •	What is differentiation of self? Why is it important? •	How does one advance up the scale? •	What are guiding principles and how do we get them? •	Why is it important to work on one’s family relationships? •	Can a leader help a floundering society to “pull up?" The Cornerstone Concept will be of enormous value to leaders immersed in disturbed family situations, complex and chaotic organizations, and societal regression. 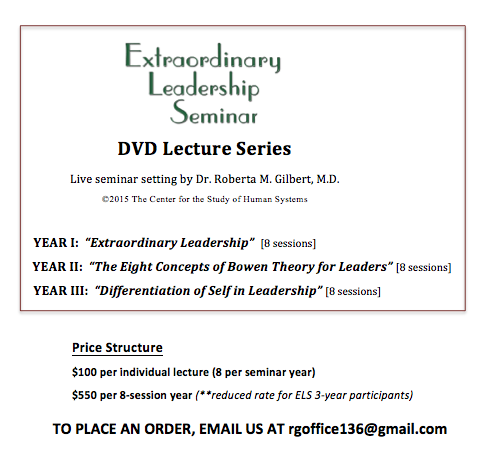 It takes its place with Extraordinary Leadership—Thinking Systems, Making a Difference and The Eight Concepts of Bowen Theory, to complete a trio of leadership texts. Today’s leaders face increased individual and societal anxiety that affects all their organizations. Unfortunately, their training has not provided them with any understanding or guidelines that show how to manage themselves in the emotional chaos and anxiety intensities. Bowen family systems theory provides the needed understanding. It has proven itself amazingly effective, not only in families, but also in non-family groups: businesses, institutions and congregations. •	What is an emotional system? •	How do leaders handle themselves in stirred up organizations? •	What is high level leadership?... low level leadership? •	How does one’s family enter into the equation? •	How does one become a high level leader? •	Do organizations need principles? •	What about difficult people? •	What is a relationship master? Bowen Theory is a new way of thinking about human interaction. It is a lens that clarifies the emotional side of families, organizations, and even society itself. It has given thousands of individuals and families a blueprint for improving their relationships, stabilizing their families and reaching their long term goals. Knowledge about human relationships and groups is probably the most desperate need of today's world. Clinically, Bowen theory has shown its usefulness over and over again. Is it as effective in organizations—businesses, universities, and congregations—as it has been in families? Professionals, executives, and clergy are responding with a resounding affirmative. They are finding, as have their coaches, that relationship patterns, maturity, immaturity, and the effects of anxiety can be found in any group of people that spends time together. They are also learning that they themselves are an important key to what happens in the system. Their leadership relationships (like those of parents) set the emotional tone for the organization. Like parents in a high functioning family, they see the value of their calm connections within their organizations as well as in their own families. Bowen theory enables them to truly "be the best they can be" and significantly increase their leadership performance in both small and large groups. Turn any relationship into an Extraordinary Relationship. After food, water, and shelter, relationships are the most important factors in determining one's quality of life. At work, productivity and efficiency depend on relationships. At home, relationships with one's spouse, children, and friends are keys to success and happiness. And among nations, relationships start and stop wars. This invaluable guide shows that only by further developing oneself can one further develop relationships. Based on the innovative family systems theory pioneered by the late Dr. Murray Bowen, this important and penetrating book offers practical and authoritative family therapy advice that has helped thousands of people throughout the last three decades. It’s a blueprint to better relationships that explains how the principles of family systems theory can be used in all arenas of life, including intimate relationships, friendships, family relationships, single life, workplace relationships, international relationships, and one's relationship with self. Email rgoffice136@gmail.com to order "Extraordinary Relationships"
Parents want a special relationship with their children. Parents care. They want to guide their children through the rough spots in life and help them make the right decisions. Research shows that a special parental connection is extremely important in safeguarding children against dangers such as substance abuse, sexual promiscuity, criminal activity, and suicide. This is more important than ever before in today’s troubled world. But what does making this connection mean? Based on Bowen family systems theory, Connecting with Our Children shows parents how to build the connection found in better relationships. Now parents have a new way to think about and respond to family problems. A talk given at a conference in Grand Rapids about guiding principles for parents in a troubled world, based on the book with additional material is now available on DVD. Principles of Bowen family systems theory applied to the challenges of Leadership and a summary of steps people take toward becoming a high level leader. High level leadership as seen in the life of John Adams. Principles of Bowen family systems theory applied to specific challenges faced by today's leaders. For information about ordering by mail, click here.